Of the 59 known soldiers of the American Revolution buried in the Big Walnut area cemeteries, 44 were missing the proper flag holder near their cemetery marker. 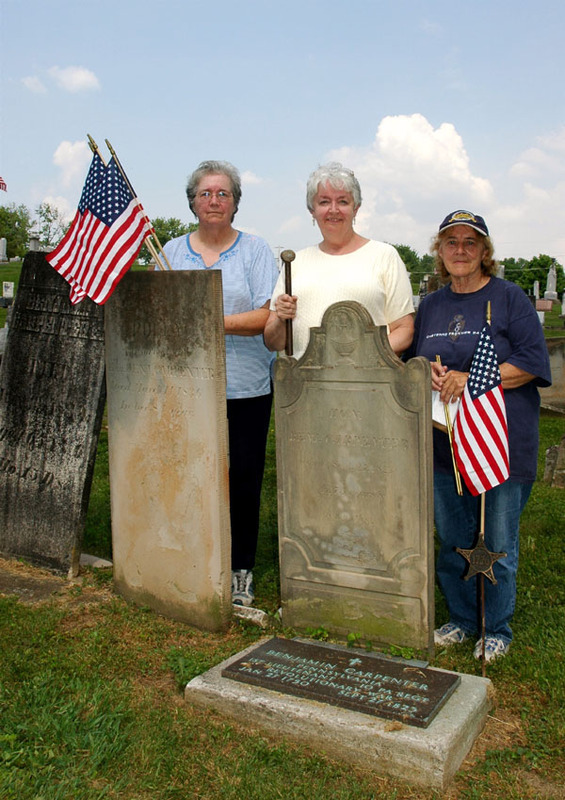 Members of the Big Walnut Area Historical Society under the chairmanship of Suzanne Allen, Bob Cheadle, Carol Wirick and Polly Horn inventoried the graves and ordered the flag holders through the Delaware County Veterans' Services. Friday and Saturday Allen, Beth Ann Williams, Warren Owen and Polly Horn put holders and flags in Blue Church, Fancher, Galena, Harlem, Red Bank, Stark and Sunbury Cemeteries so the graves would have the proper identification for Memorial Day on Monday. The Villages and Townships do an excellent job of maintaining the cemeteries and keep flags in the holders but apparently children tend to think is is humorous to move the holders. Frequently a Civil War holder was at the grave of a soldier from the American Revolution. A few were replaced because they were badly damaged. When you see the flags, remember these men fought for the freedoms you enjoy.